In today's blog we take another look at how well GrafiekRetoriek users predict exchange rate movements based on their weekly ZAR sentiment poll on Twitter. Below we take a look at a few findings showing sentiment towards the ZAR and the actual movements of the ZAR in order to determine of GrafiekRetoriek's ZAR sentiment poll is an accurate estimator of the movement of the exchange rate for that specific week. Interestingly since June 2017 up to 12 February 2018, GrafiekRetoriek ZAR sentiment poll results show that in 78% of the cases more pollers voted that the exchange rate will be weakening (depreciating) during the week ahead than strengthening, while in only 22% of the cases optimistic voters were more than than their pessimistic peers. Just showing how negative sentiment towards South Africa, its economy, its politics and its exchange rate has been in the last couple of months. Seems like not even "Ramaphoria" could boost the sentiment of twitter users voting on this weekly sentiment poll. Question is just how good are twitter users at predicting the weekly movements of the exchange rate? Are twitter users better at predicting ZARUSD appreciations or deprecations? 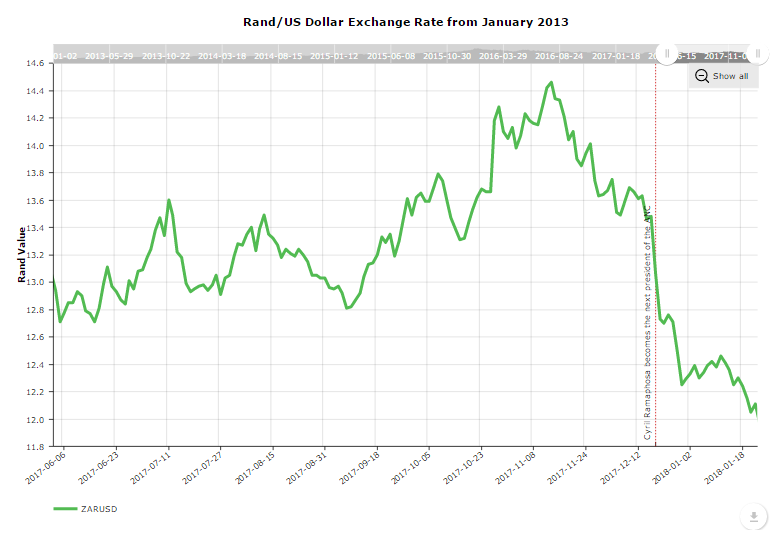 Interestingly while those taking part in the sentiment poll tend to be more negative (as the majority of cases predictions of a weakening Rand outpaces that of predictions of a strengthening Rand), twitter users are better at predicting when the Rand will appreciate (strengthen) against the Dollar than they are when the Rand will depreciate (weaken) against the dollar. The table below shows the number of weeks twitter users predicted the currency to weaken or strengthen as well as the number of times their predictions were right as well as the percentage of time twitterati predicted the ZAR movements correctly. If more than 50% of voters predicted that it would weaken, it was counted as a vote for weaken, and visa versa, where if more than 50% predicted it will strengthen it was counted as a vote for strengthen. While sentiment towards the ZAR has been largely negative and has gotten worse since our last update of the GrafiekRetoriek sentiment poll, it seems not even a change of ANC leadership can arrest the negative sentiment towards South Africa, its economy and its currency. But one has to keep in mind that the dollar has been on a very strong footing in recent weeks, especially after the news that the "trade wars" between the USA and China has been halted and the countries have agreed to engage in talks. Over 51 weeks in which this poll has been run, on average 44% of votes said the Rand would strengthen, while 56% of voters said it would weaken. So the numbers show that there has been a few very close votes as the percentage voting for a strengthening currency is not far off that 50% mark, yet in only 22% of the cases did more than 50% of voters vote for a strengthening currency. So we would say that voters are moderately negative towards the Rand. Below an interactive graphic of the exchange rate, showing just how volatile the local currency has been in recent times, with it making theme park rides look like a straight line. For more on the exchange rate see our exchange rate page, or for other economic information contained on our website, select a topic under our economics menu at the top of the page. For other graphics and information visit GrafiekRetoriek.com or follow them on Twitter.